Nick, Kath, Kate, Bella, Ruben, Tony, Donny, Janet, Phoebe, David and, of course, my lovely wife, Lynne. The kids, too, linking hands and squealing with delight when I sprayed them with water. The Reggae music through Deptford in weird juxtaposition with a Northern Irish marching band. A traditional jazz group; the melodious bongo players; the National Youth Jazz orchestra; the incredible, deafening, synchronised drumming under the A2 fly over. The joy and kindness in everyone's faces. Even the drunks were lovely. I suspect that most of us couldn't have made it without the mist showers along the way and the wonderful firemen with their hoses. I think I sprayed as much water to sooth my throbbing legs as I drank and it was fine to do that because I was so near the back of the pack. In fact, there was tons of liquid but a lot of it was Lucozade and nobody seemed to want it. The gutters were littered with thousands of discarded full and almost full bottles which had been tasted and thrown away. The yellow flood in the gutters looked as though a herd of cows had gone by urinating as they went. By the time we came to the Embankment I was hobbling but by then I had two beautiful young ladies, one on either side, carrying 'Go Gerry Jogger!" signs and the crowds went wild. I think I'll have to change my name to Gerry just to please the fan club. Everyone knows the Marathon is 26 miles but they forget the 385 yards. I won't because when I started training with Jacqueline last September I could only run 385 yards. After 26 miles it's still a daunting prospect. It's the distance from Buckingham Palace to the finishing line up towards Trafalgar Square along the Mall. As I turned the corner I could see the timer ticking round at seven hours 59 minutes and I just had to get there before it went to eight hours. I don't know where the energy came from but I managed to hobble, then heaved into a stumbling run and finally crossed the line at a reasonable sprint. Talk about mind over matter! At the end it was 7 hours 59 minutes and 33 seconds and I'm as proud of those 33 seconds as I am of the whole race. 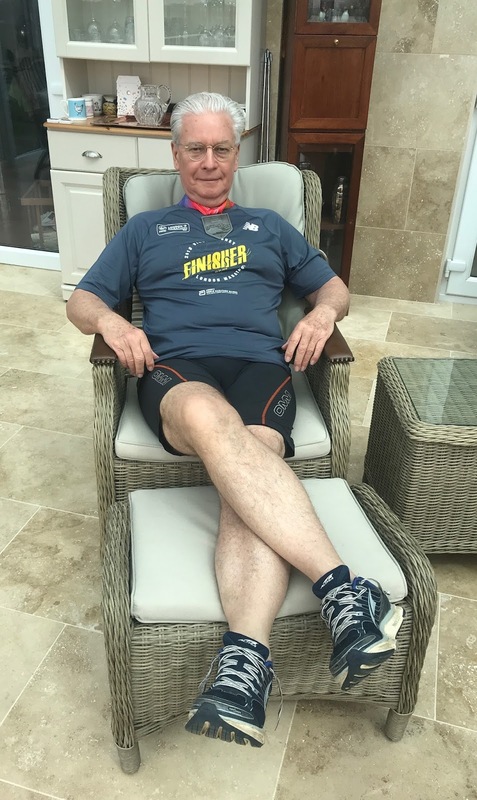 Continuing to fundraise for prostate cancer research having run the 2018 London Marathon.